It’s fair to say that we feel this is the best one yet, and for this issue we’ve got an interview that spans both the site and the magazine, with one of the head honchos at Chelsea FC. Simon Greenberg is the Communications and Public Affairs Director of the club, and not much is said, publicly at least, without his nod of approval. We gave our readers the chance to put questions to him and ask about the issues they wanted to know the answers too. Simon, can you explain what an average day involves at Chelsea Football Club? That varies; the communications department’s area of responsibility covers internal media, external media and public relations, also corporate social responsibility, Football in the Community, and all of our charitable projects. It involves being in charge of running a media business from an editorial point of view, what with Chelsea TV, the website, the magazine and programme and other publications like the yearbook. As a department we’re also responsible for public affairs, political issues whether it’s at a local, national, European or at global level, and on a football level, there’s the FA, The Premier League, UEFA, FIFA, I work closely on those subjects as well, so on a day to day basis I think it’s extremely difficult to say there’s a routine because you can see the amount of areas we cover. That’s just our immediate areas of responsibility but also we are a support to every other department in the club, in that every single thing that Chelsea Football Club does has a public exposure potential. So if there’s a problem or even a solution with the ticketing system, then we should communicate that to supporters because that is an important area for them. If there’s a marketing launch then we have to support that launch with PR, if there’s a merchandise issue, we need to communicate what that issue is, so we are a support for the rest of the club as well so what I do on a day to day basis is extremely difficult to pin down, but it would be pretty much an amalgam of most of those elements, and we’ll probably deal with a subject amongst most of those subjects in a day. Clearly we get a lot of media enquiries and the way we deal with those here is that we will try to deal with the main strategic elements of the clubs media so for example, when we presented our financial accounts, that’s a corporate issue and so I would deal with that. If an issue crops up the manager could ask me to do something or wants us to do something and you can never legislate for something that may crop up. So it’s a lot to do, and maybe people are aware of the amount of areas we have to cover or they aren’t, I don’t know. The public affairs issue is becoming increasingly important for a club like Chelsea; there’s currently a white paper going on sport and football going through the European Commission that could have an affect on Chelsea, and indeed all of football. So it’s important that football clubs get together to make sure that their interests, as a whole, are looked after. Politicians are not averse to using Chelsea or indeed football, either in a positive or negative way to suit their own ends, so it’s important to have regular contact with them. Richard Caborn (former Sports Minister) was the one who launched our CSR report and it’s important for us to keep communicating to him, and people like him, what Chelsea are doing. Some people incorrectly perceive us to be a threat to the establishment because we’re not an establishment club. Also because of our personalities; the owner, the manager, the chief executive and the players, our philosophy of how we approach things is that we are a bit different, but then we’ve got to be a bit different because we’ve got to break into the group of clubs who have been the establishment. Not just in football terms in England and Europe, but also in the political sense as we’ve got to play our role in that also. So all in all, bits of those things on a day to day basis make for a very busy job! When the media seems to go all-out against Chelsea, is the first instinct usually to try to minimise coverage by remaining silent, or try to make things right by issuing statements? There can’t be a hard and fast rule and you have to judge each individual case or story on its merits. In terms of the amount of speculation that goes on about the club, and we have research that shows us that Chelsea are the most written about club in the Premiership, in terms of the written media, and I don’t think that’ll be a surprise to anybody. We have a unique set of issues here that no other club has, a unique set of personalities that no other club has, and therefore you have to come up with some sort of guidelines about how you approach things on a day to day basis. The amount of speculation that is written about us, taking away some of the current issues that we have, means that if I spent my time reacting to the majority of the stuff written in the papers then I wouldn’t get anything else done. I have a team of people here who help me and the role of the communications department here is probably a lot wider than it is at a lot of other clubs, and maybe we’ll go into that a bit later. Because of the fact that we’re one of the top clubs in the country and have won the Premiership for a couple of years running, you inevitably have to take a lot of that on the chin and rise above a lot of it, but on occasion, and that includes reacting to transfer speculation, even though it’s our general policy to say that we don’t react and we don’t comment on transfer speculation, sometimes things have gone so far or sometimes say we’ve just signed a player and then we’re being linked with a player, or a player is alleged to be unhappy here and he isn’t, or we’re linked with another player that could make that player unhappy, sometimes we feel that in order to support the player for example, we’ll come out and say that we’re not interested in this player who plays in the same position. So we will break our own guidelines occasionally but I don’t think we should do it too often. I don’t think that the media is all out against Chelsea I just think that we’re the biggest story in town, for the reasons outlined already in terms of our personalities, our issues, our location in London, they’re all big factors. The fact is that Manchester United isn’t in London, it’s in Manchester, and every single major international media organisation has an office in central London. That means that within half an hour of us making a statement or calling a press conference, we can have every major media organisation in the world here on our doorstep, and no other club can say that. It’s a location issue and an identity issue about Chelsea, that identity was given a new meaning by the takeover by Roman Abramovich in 2003, it’s what I call ‘the cocktail’ that is Chelsea. We have so many elements that other clubs don’t have, and you imagine it’s like a cocktail shaker, you put all the ingredients in and shake it all up then we have a cocktail that no other club has. I’d never say that the media is against us although sometimes it appears as if it is, and sometimes it is, but I don’t believe that its general default position is one that is against us. All of our elements mean we have to take a lot on the chin. It’s the British way to knock the top dog and love the underdog; I don’t make any judgement on that, it’s just the way that it is. I don’t believe we should get too hung up on that because there is absolutely nothing that me, Jose, Peter, the fans or anybody can do about that, it’s a cultural thing that just will not change, it is the way it is, and I think we just have to adapt around that. So sometimes, yes we will break our policy and I don’t make any excuses for that either, sometimes when you deem it necessary then you’ve got to do it, when people say to you that you always say you don’t comment on transfer speculation, we’ll say that on this occasion we want to, that’s our right, our right to support a player, our right to support our manager. In the current climate of perceived issues that we have, the club has come out in support of Jose, categorically, and we don’t feel the need to say anything more on the subject as we’ve said it once already, but it was never going to end the speculation. When we discussed internally our position at the time I said that it wouldn’t end the speculation, that it would continue regardless, but we felt it necessary to show support for Jose, to try and communicate with the fans as well, and to end the speculation, but I was under no illusions that it would end it, and it hasn’t ended it. I’m convinced, and no-one will be able to convince me otherwise, that had we not drawn three matches over Christmas and the New Year, where we dropped points, then everything that followed would never have happened. We wouldn’t have had the speculation in the media had we beaten Reading, Fulham and Aston Villa, because everything ultimately stems from results on the pitch.Whether or not things are going on behind the scenes, that’s not for me to comment on and we never would comment on it, but the public play out in the media that there has been, would not have happened had there not been a perceived crisis at Chelsea, had we not fallen behind Manchester United in the title race, the reason it died down was mainly related to results on the pitch. If our results are good then it will die down even more, but if results don’t go well and because football is football, then maybe it will start again. We’re not wedded to any policy or rule and we do what we believe is right at the time, but as a general guideline you just can’t react to speculation on any level all of the time because you end up creating another story and it’d end up taking up all your time and would be diverting your energies away from what you should be doing. Peter and I have discussed this before, if you believe what you are doing is right, then you shouldn’t allow anything to divert you away from it, so if we believe we’re doing something correctly then we’ve just got to carry on, no matter what. A lot of people rang me up during the perceived problems of the last months of the season, telling me I seemed very relaxed about it all. I said to them that we’ll let everyone else lose their heads, but we’ll keep ours. 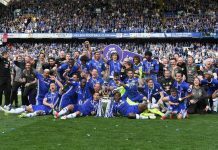 The most important thing is winning matches, hopefully winning trophies, and what we were doing is trying to create an environment to assist that process and to be honest that is what we are trying to do all of the timeIs it hard to create a positive image of the club, when there are so much negative, false or intrusive stories about Chelsea, its players and staff? We’re always trying to, not necessarily create a positive image as there is one there already, we would always try and work on that and present everything as positively as we can. The are a lot of negative stories around, a good proportion of those is because that’s the nature of the British media, and I wouldn’t just say the written media here, because I think you can fall into the trap of saying; ‘It’s the press’ fault’. It’s all of the media, they like a negative story, because generally the negative stories are the ones that sell more across a season. Of course they want English clubs to do well in Europe and win the Champions League, because that’s a great news story for the country and for them, but during the course of a season, the stories that will sell more are the negative ones and the whole media is guilty of that. Again, that’s the culture and you try to adapt to that culture and try to work within that culture and try to make as many positives stories and as positive an image for the club as possible. It’s not always easy, sometimes it’s extremely difficult, sometimes you’ll be accused of defending the indefensible but if people are criticising the club, or manager or the players for something they’ve done we will defend them publicly, every time. We will get criticised for defending them but we will always defend them, what happens behind the scenes might be different, but as a club, and again as a guideline, we try not to play out what is happening behind the scenes in public, because that’s nobodies business other than ours. At some point we understand we have to communicate club positions and club policies to the fans, but until those policies are formulated and decided, we don’t believe its right for us to debate everything in public. I understand the frustrations of a football supporter, because I think it’s the same whichever club you support, be it Doncaster Rovers or Chelsea, you want to know what is going on, you have a certain right to know what is going on, because in many ways the supporters are the most important stakeholder in the club, along with the staff of the club, players and the management, they’re all important stakeholders, and in many ways it’s also the fans club. We as a group of directors have, rightly or wrongly been given custodianship of the club, because we run it, in our various areas. People may disagree with what we do but the fact is we’re not elected, so I’ve been given my job as a result of people’s belief that hopefully, I’m the best person for the job. People may disagree with how I do that job, but they have to understand that I do it with more than 100% commitment, total professionalism in so far that I am a professional and with the absolute best interests of the club at heart, and that includes considering the fans interests. To read Simon’s answers as to whether Shevchenko was a Jose or Roman signing, or the what he and Jose think of the media in this country, and much more besides, order Issue 4 of the CFCnet magazine now.